We found 1 very last copy of the COLORED VINYL box set! 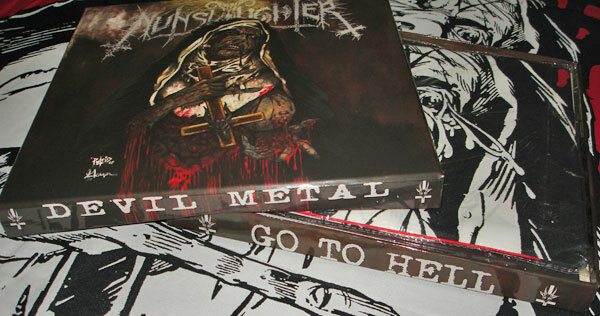 100 copies on BLACK Vinyl, 400 copies on COLORED Vinyl. Nearly 2 hours of music spread across 4x 12" LPs (one of which is a picture disc). 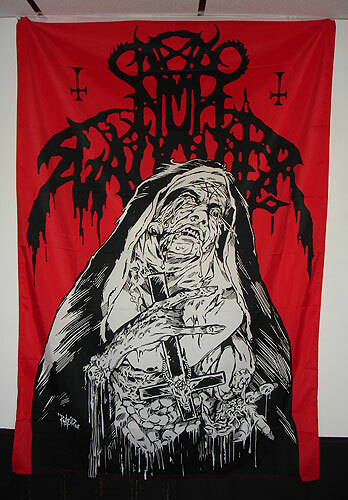 Includes a MASSIVE 4ft (1.22m) X 6ft (1.83m) banner/flag and 50-page 12" booklet archiving the original demos artwork, lyrics, reviews, interviews, photos and liner notes. Also includes a bonus radio interview with Don of the Dead, not featured on the CD version. 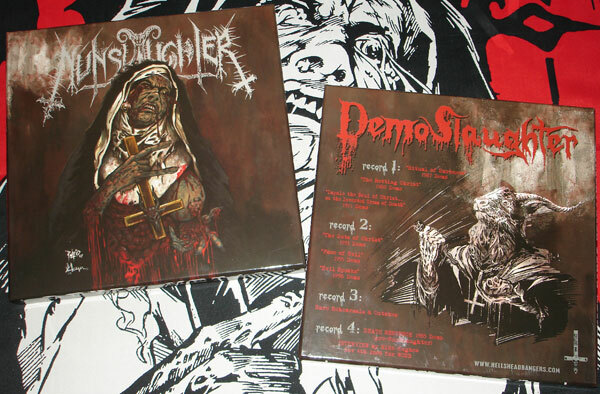 The black prayers of Devil Metal worshipers have finally been answered... At last, for the first time ever, all 6 of the cult demo recordings now gathered together as a single release entitled "DEMOSlaughter". Each of these long-sold out recordings were previously only been available as individual cassettes & 7" EPs with very limited circulation throughout their 24-year history. Also included exclusively for this release, obscure rehearsals and the 1985 demo from DEATH SENTENCE (pre-NunSlaughter) all of which have never been heard before.